Description - Our Impact Rolls – Wood Series is one of our most popular floors for group exercise, pilates, and the like, but there are some drawbacks to this product. Well, we have listened to all of our valued customers and have come out with our latest version of this floor, Impact Rolls – Wood Series HD. This roll features all of the great qualities of the original version with some added benefits. Our HD version now resists indentations, which is great for any multi-use space. So no spin classes can be used on this floor without any worries of indentations. The visuals have also been updated to feature more realistic looks. After it's installed, tell us if your customers don't give the floor a double take. One last improvement is on the impact absorption side. Since these rolls are used around the home as well as flooring for in-home care, as sensory room floors, and the like, we have made these rolls more shock absorbent. Now when someone falls they are less likely to incur a serious injury, which means everyone can sleep easier at night. A 5-year warranty backs our Impact Rolls – Wood Series HD. Material – 2mm Virgin vinyl over top 5mm recycled rubber underlayment. Size – Available in 6'x25', 6'x30', and 6'x45' rolls. Weight – 1.39 Lbs. per square foot. Recommended Uses – Impact Rolls - Wood Series HD rolls are the perfect flooring option for any multi-use studio, for pilaties classes, for yoga studios, as flooring in sensory rooms, and in-home care flooring, as ergonomic flooring, and much more. Daily or weekly vacuuming or dusting of dirt, grit, dust etc. When mopping, use a damp mop. Never a wet mop. Clean up spills immediately to prevent damage to the flooring surface. 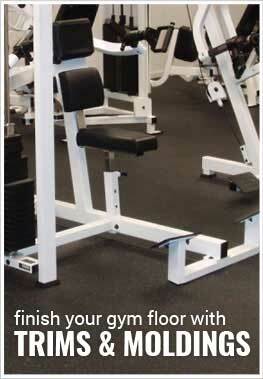 Great as flooring for multi-use exercise rooms, as in-home care flooring, and more. Can be made hygienic when heat welded.